This is a top floor two-bedroom two-bath condo in building 4. Free WI-FI. 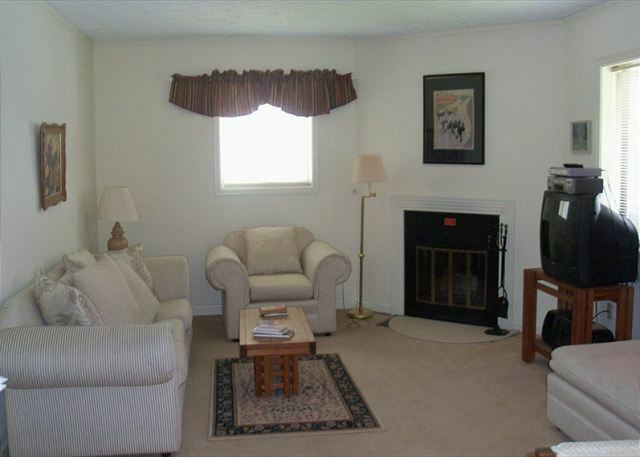 The living room offers a 25 inch flat screen TV, a queen sleeper sofa and a wood burning fireplace. 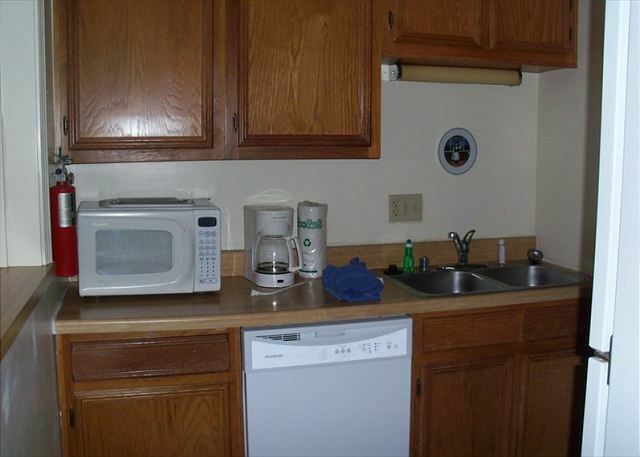 The kitchen is fully equipped with many accessories. There is seating for 4 in the dining area with additional seating at the bar. The master bedroom offers a queen size bed. The guest bedroom offers two twin beds. From your private balcony you will experience long range mountain views and a ski in/out slope view of Oma's Meadow. The property also has tennis courts and outdoor grilling areas. This unit does not have washer/dryer. There is a coin operated laundry on property. Best ski vacation rental our family has ever had. Very good. We had a blast. The snow sucked, but we made the best of it. Everything was lovely with one exception. The blinds in the bedrooms do not block out enough light. Perhaps some curtains would help. Great! My only concern was Fire safety at all the units with wood burning fireplaces. Great View and spacious condo! We enjoyed our stay and using the facilities at Sugar Ski and Country Club. Our room was nice and clean with a great view. We will be back!!! When we first walked into the condo, we immediately knew we would not be cold all weekend. The heaters in this place work very efficiently. We had to turn all of them off and just enjoyed the heat escaping from the floors below. The windows and doors were a source of entertainment for us. They do not seal very good at all and all night, especially in the wind, you could hear the wind coming through the doors and windows to the point they had frost and ice on the inside of the windows and a pile of snow at the doors where it had frozen over and were unable to close all the way. As I said, we were not cold at all and it was entertaining and not a problem at all. The amenities were very worth the money and we had a blast. Being able to ski right down the hill was a plus. We did have an altercation with the bottom of the hill in obtaining a ski lift right at 9:00pm when the windows closed but all in all we had a wonderful time. The bed in the master bedroom is to small and uncomfortable and the sofa bed in the living room is uncomfortable, my son could not sleep open the sofa bed, he sleeps on the sofa.